How do I delete an old course from Dashboard? And can you move the tiles to different locations? I would like to customize my dashboard and get rid of old courses that are outdated. I would also like to move my current semester to the top of the dashboard. Thank you! In order to remove a course from your dashboard, you need to unfavorite the course. You can do that by following the instructions below or going to this Canvas Guide on Customizing Courses. 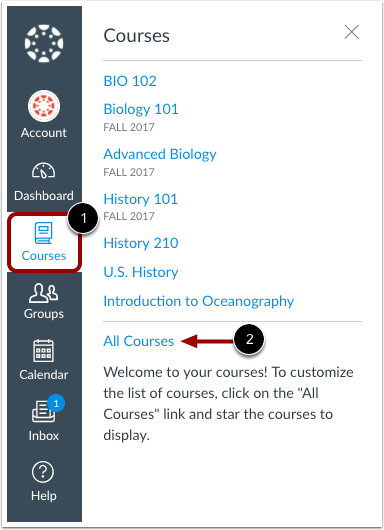 Note: After you have manually favorited at least one course, Canvas automatically favorites any newly published course enrollments for you. Moving or sorting the Dashboard cards requires a Canvancement that James Jones created. You can find the Canvancements in the community. Once you go there you are looking for the Sorting Dashboard Course Cards. Once you click on that link you will find a walkthrough on how to install tampermonkey and the script that will run in your browser that will allow you to move the cards around. It is absolutely amazing and extremely helpful. Please let me know if there is anything else that you need or have questions on. Thank you so much! That’s exactly what I needed. That is terrific news. Don't hesitate to reach out if you need anything else.